These flavorful soft-boiled eggs used as a ramen topping are called Ajitsuke Tamago (味付け卵) in Japan, which literally means "seasoned egg." This White Ramen Egg is marinated in a clear broth making it look like a regular soft-boiled egg and yet it has the perfect savory-sweet balance with loads of umami. For my Ajitsuke Tamago, I usually like to use the braising liquid leftover from when I make Pork Belly Kakuni. While the liquid makes for an ultra-flavorful brine, it has one major drawback: you have to make kakuni before you can make the egg. That’s why most recipes use a broth made from soy sauce, sugar, and mirin, which gives the egg its trademark cafe latte hue. While a light brown egg may look great floating in a bowl of midnight brown shoyu ramen, they get lost in lighter color broths like miso or shio. This is probably why some shops use a white soft-boiled egg that’s been seasoned with salt. It’s stunning to see a perfectly white orb with a liquid ochre yolk arranged alongside a stack of green scallions and melt-in-your-mouth chashu. The problem with this approach is the impact is purely visual. When the eggs are just seasoned with salt, it gives them a very one-dimensional taste. While you could argue that the rest of the ramen has enough flavor to carry the egg, I believe that a great bowl of ramen is about the balancing interplay of each ingredient. So how do you make a White Ajitsuke Tamago that’s packed with flavor? I started with a basic brine of salt and sugar which gives the egg a savory sweet taste. Unfortunately, these seasonings alone lack umami producing amino acids, which is what makes Ramen Eggs taste so good. This is where the magic of sake comes in. Sake is an alcoholic beverage brewed from rice using kōji and yeast. Kōji, a filamentous fungus, converts the starches in the rice into sugars, while the yeast converts the sugars into alcohol. Contrary to popular belief, alcohol in and of itself doesn’t make food taste better; this is why you usually boil the alcohol off. It’s the aromatic compounds and amino acids contained in some alcoholic beverages that make them so delicious to cook with. Sake, in particular, is loaded with TONS of amino acids, a byproduct of the fermented rice, which makes practically anything you add it to taste better. Because you boil the alcohol off before soaking the eggs in the brine, you don’t have to worry about getting yourself (or your kids) drunk. You can’t have a delicious ramen egg without the molten core of golden yolk, and the tricky part of this dish is getting the egg boiled to the right consistency. 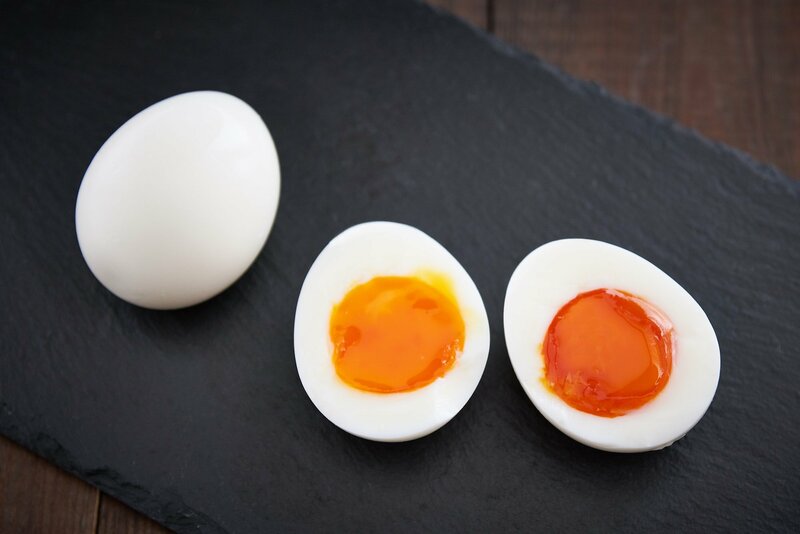 There are so many variables that can affect the boiling time of soft-boiled eggs such as the temperature of the water, the starting temperature of the eggs, and even the type of pot that you use. That’s why I’ve created a post which factors in all the variables involved in boiling an egg. 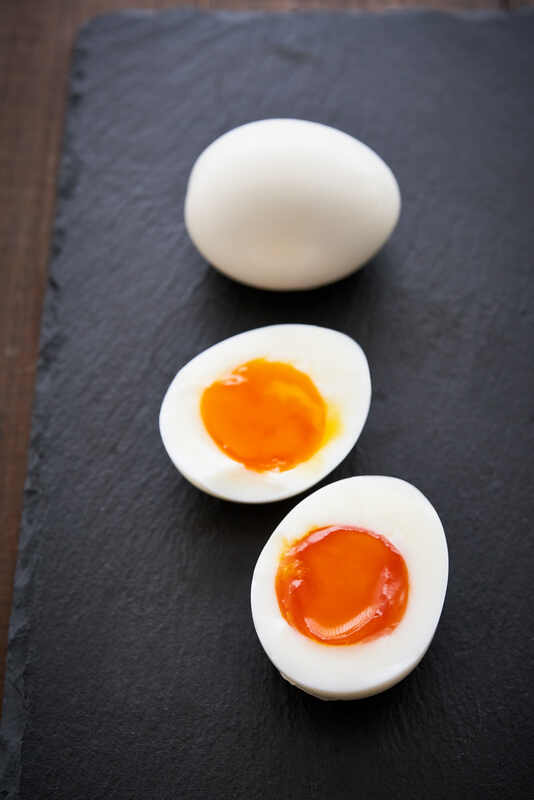 Check out my perfect soft-boiled egg tutorial for the details, along with a trick to make them easier to peel. So how do you use Ajitsuke Tamago? By far my favorite way to eat these is by themselves. Because they can be made ahead and kept refrigerated for a few days, they’re the perfect quick breakfast or evening snack. In the morning I might have one with a piece of toast, and in the evening they go great with a glass of sake. Because the salt helps to preserve them, Ramen Eggs are a fantastic addition to bento boxes. Along with some chicken teriyaki and rice they make for a colorful deconstructed oyako donburi. Mashed together with some mayonnaise, lemon juice, chopped celery, and pickles; and they can be turned into a delicious tartar sauce. Last but not least there’s the most obvious use, which is as a topping for ramen. I like to use this White Ajitsuke Tamago for lighter colored broths like my chicken ramen. To make the brine, add the water, sake, sugar, and salt to a pot and bring to a boil. 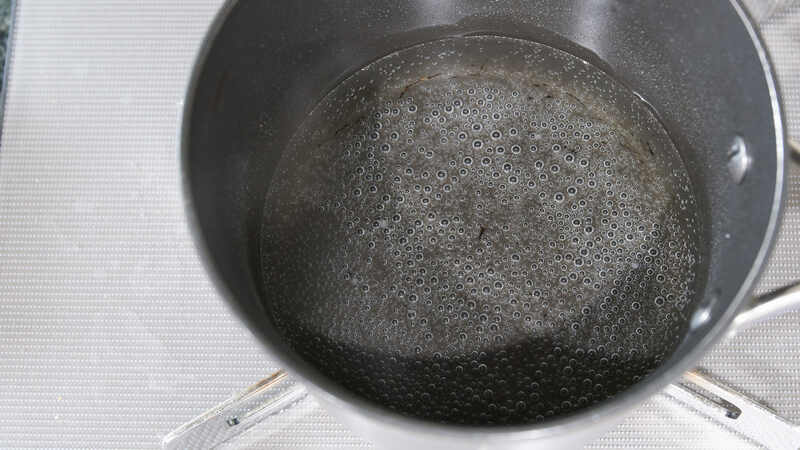 Continue boiling until the vapor no longer smells like alcohol. Remove the pot from the heat and chill to room temperature. Put the peeled eggs in a freezer bag and add the brine. 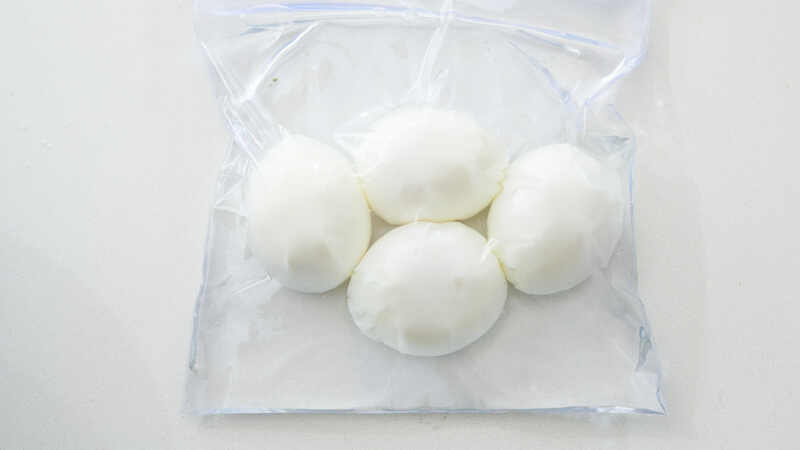 Seal the bag, pressing out as much air as possible and refrigerate the eggs for at least overnight or up to 2 days. 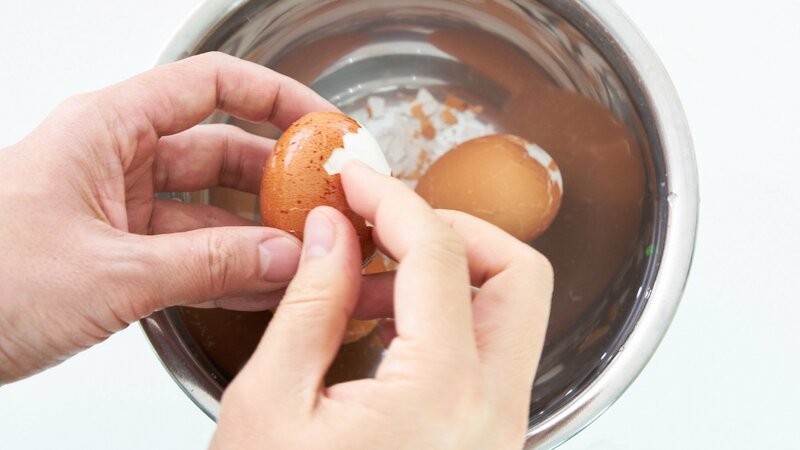 If you want to keep them longer, remove the eggs from the brine after 2 days. Store them in a sealed container in the refrigerator for up to another 2 days.